Jonathan Fishman, Edward Fisher, Musheer Hussain,	The Journal of Laryngology & Otology, Volume 132 Issue 9, p 763. N H Davidoss, R Eikelboom, P L Friedland, P L Santa Maria,	The Journal of Laryngology & Otology, Volume 132 Issue 9, pp 764-770. J Hornibrook,	The Journal of Laryngology & Otology, Volume 132 Issue 9, pp 771-774. C Peled, M Kraus, D Kaplan,	The Journal of Laryngology & Otology, Volume 132 Issue 9, pp 775-779. M Forgues, R Mehta, D Anderson, C Morel, L Miller, A Sevy, L Son, M Arriaga,	The Journal of Laryngology & Otology, Volume 132 Issue 9, pp 780-785. Y Abbas, G Smith, A Trinidade,	The Journal of Laryngology & Otology, Volume 132 Issue 9, pp 786-789. R P Morse, A Mitchell-Innes,	The Journal of Laryngology & Otology, Volume 132 Issue 9, pp 790-795. O Çakır, G Berkiten, B Tutar, A B Yılmazer, T L Kumral, Z Saltürk, Y Uyar,	The Journal of Laryngology & Otology, Volume 132 Issue 9, pp 796-801. M Wróbel, P Sobolewski, G Greczka, W Gawęcki,	The Journal of Laryngology & Otology, Volume 132 Issue 9, pp 802-806. A Bhardwaj, A Anant, N Bharadwaj, A Gupta, S Gupta,	The Journal of Laryngology & Otology, Volume 132 Issue 9, pp 807-811. A C Walker, P Surda, M Rossiter, S A Little,	The Journal of Laryngology & Otology, Volume 132 Issue 9, pp 812-815. N Siupsinskiene, I Katutiene, V Jonikiene, D Janciauskas, S Vaitkus,	The Journal of Laryngology & Otology, Volume 132 Issue 9, pp 816-821. S Saint-Victor, E Barbarite, C Sidani, R Bhatia, D E Rosow,	The Journal of Laryngology & Otology, Volume 132 Issue 9, pp 822-826. K Mahawerawat, P Kasemsiri,	The Journal of Laryngology & Otology, Volume 132 Issue 9, pp 827-831. 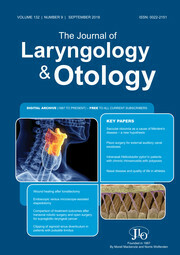 B Karabulut, İ Deveci, M Sürmeli, A Şahin-Yilmaz, Ç Oysu,	The Journal of Laryngology & Otology, Volume 132 Issue 9, pp 832-836. F Hassannia, S D Carr, G-M Busato, J A Rutka,	The Journal of Laryngology & Otology, Volume 132 Issue 9, pp 837-839. P M Puttasiddaiah, S T Browning,	The Journal of Laryngology & Otology, Volume 132 Issue 9, pp 840-841. A Hardy, J Muzaffar, R Kumar, R Irving,	The Journal of Laryngology & Otology, Volume 132 Issue 9, pp 842-845. M Mat Baki, P Clarke, M A Birchall,	The Journal of Laryngology & Otology, Volume 132 Issue 9, pp 846-851. V Givens, K Brent, M Dunham, S P Kanotra,	The Journal of Laryngology & Otology, Volume 132 Issue 9, pp 852-855.